There is no better coastline tour of the Santa Monica Bay and the Long Beach coast than the Outlaw Regatta, hosted by Santa Monica Windjammers and Seal Beach Yacht Club. This annual regatta drew 29 boats this year and provided the fleet with challenging conditions. The starting sequence promised excitement with winds in the 14-16 knot ranges, however, the thought of a fast finish was short-lived and by the time the fleet reached Point Vincente, the wind was already down half of that with 20-degree lifts and headers forcing everyone to play the course conservatively. While sailing may not seem like a spectator’s sport, the resorts along Palo Verde were lined with onlookers as the fleet passed by under their colorful spinnakers. Reefs and submerged rocks made this part of the course tricky as the boats played the shifts along the cliffs en route to Point Fermin. Long Beach did not present its usual summer breeze as the fleet entered the bay and a light air run to the finish inside of Alamitos Bay brought the event to an end. 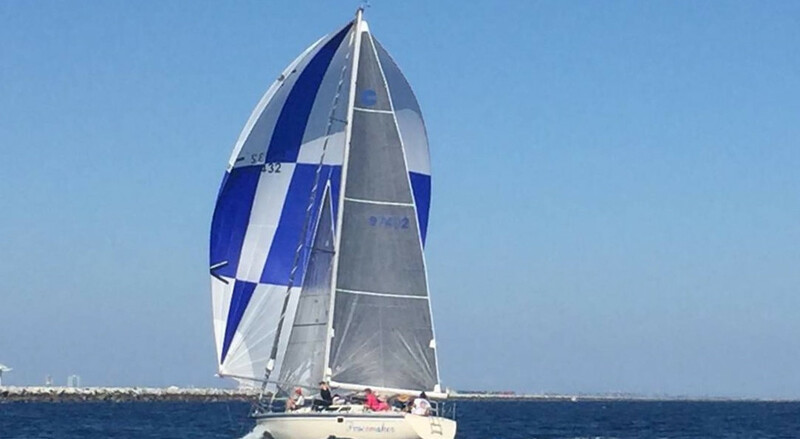 The overall winner was Jerry Kaye aboard his C&C-SR25 “MisQue,” flying his 100% Ullman Sails inventory.